This article is about the microgame from WarioWare: D.I.Y.. For the microgame from WarioWare: Touched!, see Mario Paint (WarioWare: Touched!). For the game, see Mario Paint. Info "Pick a color and paint the shape!" 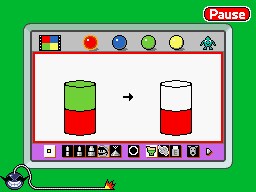 Mario Paint is one of 9-Volt's microgames in WarioWare: D.I.Y. This microgame is based on the video game Mario Paint for the Super Nintendo. The purpose of the game is to color the two cylinders exactly like the example shown. When the game starts, there is a two-cylinder pillar colored already with a mix of either red, blue, yellow, or green. There is also another object exactly the same, but without color. The player needs to tap a color from the palette above and tap the object to give it that color. If the player manages to color the cylinders before time runs out, the game ends in a win. However, if the player accidentally chooses the wrong object, the wrong color, or time runs out, the game ends in a loss. When the player imports/views this microgame in the Game MakerMatic, when editing background/objects, the first background music will play. When the player imports (can't be done by viewing) the microgame and edits shapes/stamps/letters, the second background music from can be heard. When the player makes custom pallettes/stamps, the third background music will play. The same applies to this, but there are no Mario Paint comics, so the player must make a custom Mario Paint comic. Making a custom microgame with Mario Paint as its title will be the same. This page was last edited on July 16, 2018, at 12:25.